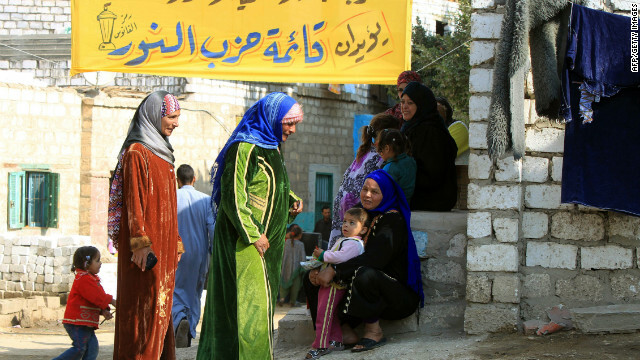 Egyptian women gather near a polling station during parliamentary elections in January. In May, Egypt elects a president. Two high-profile elections came to a head this past weekend, with voters in France and Greece taking their countries in a new direction. But there’s still much more to watch for in 2012, a year in which nearly a third of the world’s countries are casting ballots. “Some of these elections and leadership changes involve nothing more than personnel shifts; others will be occasions for fundamental debates about the future course of the country,” wrote CNN’s Fareed Zakaria as he previewed this “year of elections” back in December. So far, we’ve already seen a handful of leadership changes on several continents. In addition to Francois Hollande in France, new presidents have been elected in Finland, Yemen, Senegal and Russia (although many argue Russian President Vladimir Putin never really left power). Like Greece, there have been clear parliamentary shifts in Iran, Myanmar and South Korea — all very different countries with their own separate issues and priorities. Is this volatility a sign of what’s to come? What does the future hold for the countries that haven’t voted yet? The Egyptian military, which has been in charge of the country since longtime President Hosni Mubarak was forced from office in February 2011, promised to turn over power to an elected civilian government. But election delays and the slow pace of reform have angered many Egyptians and raised doubt over the generals’ willingness to give up power. So has controversy over the presidential race, set for later this month. Ten of the 23 candidates were disqualified in April over “legal irregularities,” and some claim the disqualifications were politically motivated, especially the barring of Khairat el-Shater, the Muslim Brotherhood’s first-choice candidate. The Muslim Brotherhood, the Islamist party that dominated recent parliamentary elections, has been at odds with the ruling military. The outcome of this election will surely be one of the lasting legacies of the so-called Arab Spring. Will the military keep its word and step aside, even if the winning candidate is someone who doesn’t share their interests? And if an Islamist wins, would Egypt be governed by Sharia law? When Mexican President Felipe Calderon took office nearly six years ago, he launched a full-scale offensive against the country’s drug cartels. The results have been staggering: Nearly 50,000 people have been killed in drug violence since December 2006. Whether Mexico is ultimately winning the war is up for debate, but Calderon’s political future is not. Mexican presidents can only serve one six-year term, so there will be new leadership in place by the end of the year. Leading the polls is Enrique Peña Nieto, a former Mexico state governor whose party opposes Calderon’s. His main opponents are Josefina Vazquez Mota and Andrés Manual López Obrador. Vazquez Mota, the candidate of Calderon’s party, is looking to be Mexico’s first female president. López Obrador lost a close election to Calderon in 2006. While the economy and job creation are major talking points in Mexico, drug violence is still the primary issue on many voters’ minds. Eurozone governments are feeling the strain of austerity. France and Greece are just the latest to experience upheaval; they are not alone. Last month, Dutch Prime Minister Mark Rutte resigned when a far-right party withdrew from talks over an austerity package worth 14.2 billion euros (about $19 million). Parliamentary elections are now set for September. How will the Dutch choose to address their economic woes going forward if voters take an anti-austerity stand? And what will it mean for the embattled eurozone and the future of a single currency? Since Venezuelan President Hugo Chavez was first elected in 1999, he has withstood mass protests, a coup attempt and a recall referendum. But as he struggles with serious health problems, perhaps his toughest challenge is yet to come. Chavez’s challenger, Henrique Capriles, is a former tax attorney, mayor and governor almost 20 years younger than the president, and he won nearly two-thirds of the primary vote in February. “Capriles is reading Venezuelans correctly,” said Diana Villiers Negroponte, a senior fellow with the Brookings Institution. “His conciliatory, pragmatic and non-ideological discourse is bearing fruit, as is his readiness to acknowledge Chávez’s contributions to the poor. Chavez is still very popular in Venezuela, and he has been resilient through the years. But his health is now a major concern, because he was diagnosed with cancer last year and recently had an operation in Cuba to remove a tumor from his abdomen. Will he even make it to the election? Who would succeed him if not? Chavez has been a longtime critic of U.S. foreign policy, and oil exports to the U.S. are at their lowest level in 20 years. Would that change with Capriles in power? According to Reuters, Capriles has promised to prioritize relationships with “democratic” nations. Unemployment is still high, but Obama argues that conditions are improving and the worst is over. A recently released campaign video touts Obama’s handling of the economic crisis as well as other accomplishments, including health care reform and the killing of Osama bin Laden. The latest polls show that a close race is in store. But it all could change because of one key statistic. Next entry »How will current woes shape the EU's future? « Previous entryNetanyahu, king of Israel? The United States is no longer the dominant power in the free world. Obama will work much better with global leaders than Mr Romney. Sadly there are so many who can not accept the fact that this very smart man is african american. Let's look past his sin color. So many in american hate Obama, in his own country,but the world loves him. Believe me I have traveled abroad many times. He is so beloved by world leaders and people abroad. Someone please tell me how one man can take a whole country down ?? How ?? To all conservatives....Obama wins relections in Novemeber. Like it or not, Mr Obama wins re-election. No one mancan take down a country. It takes more than one. He loves this country as much as anyone. Respect to op , some good selective information . “If you don’t leap, you’ll never know what it’s like to fly.” by Guy Finley.